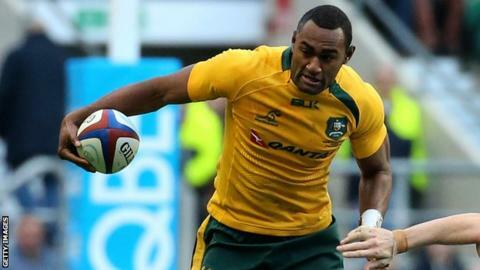 Tevita Kuridrani will miss Australia's autumn Tests against Scotland and Wales after being banned until mid-February for his red card against Ireland. Kuridrani, 22, received a straight red card following a tip tackle on Peter O'Mahony in the Wallabies' 32-15 win. The Brumbies centre, who has the right of appeal, is free to resume playing on 17 February. Australia face Scotland at Murrayfield on Saturday and Wales at the Millennium Stadium on 30 November. Professor Lorne Crerar, the International Rugby Board-appointed judicial officer, ruled that Kuridrani's offence warranted an eight-week ban. He added a ninth week as a deterrent for this type of tackle - but then took four weeks off to reflect Kuridrani's previously good disciplinary record and other mitigating factors. The resulting suspension of five weeks can only be served during Kuridrani's playing schedule, meaning it will not expire until mid-February. for the visit to Edinburgh for drinking in midweek before Saturday's win over Ireland. Adam Ashley-Cooper, Nick Cummins, Liam Gill, Tatafu Polota-Nau, Benn Robinson and Paddy Ryan will not face Scotland.